So it turns out that Matt Yglesias advocates replacing Medicare with cash grants to senior citizens. Tyler Cowen agrees from a libertarian perspective, but suggests this be presented as an alternative to traditional medicare rather than forced on everyone. Cowen cites Paul Krugman’s comment about government-provided healthcare, that “what would terrify the right . . . is the likelihood that genuine socialized medicine would actually win that competition” with private insurance. Cowen responds that “What would terrify the left . . . is the likelihood that genuine privatized cash would actually win that competition.” This strikes me as a case of the common political fallacy where the motivations of one’s political opponents are assumed to be the inverse of one’s own: if conservatives are in favor of less government, the left must be in favor of more government. But this isn’t very plausible; most liberals and leftists that I’m aware (including me) see government as a means of achieving social justice and equality, not as an end in itself. In general, I’m very much in favor of doing redistribution by just handing people unconditional cash rather than subjecting them to bureaucratic tests and restrictions. In the specific case of health care, however, I’m not persuaded. This is not because I think government health care is inherently desirable, but because I think just giving people money to purchase their own health care violates the communist principle that underpins social rights in the welfare state. What does it mean to say that social rights are communist, with a small “c”? Only that they are based on the principle of from each according to ability, to each according to need. In a capitalist society with an unequal distribution of income, “ability” becomes “ability to pay”. This principle, that contributions to the welfare state should be proportional to income, is well established– although in practice it is of course deeply contested. What is more difficult is determining what qualifies as “need”. The simplest way to deal with this is to say that the state should be neutral about what specific things individuals “need” to live a decent life, and should instead just give everyone the means to procure whatever they view as their basic needs–in other words, we should just give everyone money. This is the principle behind the Basic Income, which is based on ensuring that everyone in society receives some baseline income irrespective of work and which is something that I strongly support as a long-term goal. However, simply giving everyone an equal amount of money is a solution that breaks down in cases where, for reasons that are basically outside the control of individuals, needs are very unequally distributed. And health care is the pre-eminent case of this. Some people simply require more health care than others, whether because they happen to be genetically predisposed to illness, or because they get hurt in an accident, or because they get cancer, or because they happen to be a woman. This is why it makes sense for Medicare to be organized the way it is: from each according to their ability to pay (though this principle is compromised because not all income is subject to Medicare taxes), and to each according to their need for health care services. Setting things up this way creates political and policy problems, of course, because someone has to decide what counts as a health care “need”. Hence all the debates we’ve been having about Cadillac health plans, comparative effectiveness research, death panels, etc. Moreover, there will inevitably be a struggle to define just which health conditions are truly involuntary, and which reflect individual decisions regarding, e.g., diet and exercise. But handing people checks is no substitute at all. If you just hand people money and tell them “go buy some health care”, you’re doing an injustice to those who have higher health care costs through no fault of their own. If you tell them to “go buy some health insurance” instead, then you either create a market where insurers will only take healthy applicants, or you go in the direction of mandates on insurers to accept people and mandates on individuals to buy insurance. At that point, you’re basically back to guaranteeing people access to the health care they need, rather than telling them to buy as much health care as they want. Marxists put themselves in a scientifically and polemically weak position if, after rejecting the idealist arguments which claim to show that the only reality is that of the Spirit and that cultural facts are in no way dependent on economic structures, they then borrow the same arguments to deny the dependence of man on nature. The position of the contemporary Marxist seems at times like that of a person living on the first floor of a house, who turns to the tenant of the second floor and says: ‘You think you’re independent, that you support yourself by yourself ? You’re wrong! Your apartment stands only because it is supported on mine, and if mine collapses, yours will too’; and on the other hand to the ground floor tenant: ‘What are you pretending? That you support and condition me? What a wretched illusion!’ . . .
To maintain that, since the ‘biological’ is always presented to us as mediated by the ‘social’, the ‘biological’ is nothing and the ‘social’ is everything, would once again be idealist sophistry. . . .
. . . it must be added that although the biological level has virtually no importance in determining traits distinguishing large human groups (there is, for example, no correlation between membership of a certain race and the possession of certain intellectual or moral gifts), it does again have a conspicuous weight in the determination of individual characteristics. Humanity is not made up of individuals who are all equal in psycho-physical constitution, differentiated only by the social environment in which they happen to find themselves. Recognition of these brute physical facts of existence forces us to confront the complex texture of human needs. Thus while the formal economic equality signified by the basic income is an important general principle, it must be supplemented by direct provision of services in areas like health care, where needs are seriously unequal. This is, among other things, something that differentiates the left-wing and Marxist-influenced conception of basic income from the right-wing version propounded by someone like Charles Murray. I’m going to do a little series on manufacturing, because after doing my last post I got a little sucked into the various data sources that are available. Today’s installment comes with a special attention conservation notice, however: this post will be extremely boring. I’ll get back to my substantive arguments about manufacturing in future posts, and put up some details about trends in productivity in specific sectors, some data that contextualizes the U.S. internationally, and a specific comparison with China. But first, I need to make a detour into definitions and methods, just so that I have it for my own reference. What follows is an attempt to answer a question I’ve often wanted answered but never seen written up in one place: what, exactly, do published measures of real economic growth actually mean? the physical or chemical transformation of materials of components into new products, whether the work is performed by power- driven machines or by hand, whether it is done in a factory or in the worker’s home, and whether the products are sold at wholesale or retail. Included are assembly of component parts of manufactured products and recycling of waste materials. There is some uncertainty about how to classify workers who are only indirectly involved in manufacturing, but in general it’s fairly clear which workers are involved in manufacturing according to this criterion. The concept of “output”, however, is much fuzzier. It’s not so hard to figure out what the physical outputs of manufacturing are–what’s difficult is to compare them, particularly over time. My last post was gesturing at some concept of physical product: the idea was that we produce more things than we did a few decades ago, but that we do so with far fewer people. However, there is no simple way to compare present and past products of the manufacturing process, because the things themselves are qualitatively different. If it took a certain number of person-hours to make a black and white TV in the 1950’s, and it takes a certain number of person-hours to make an iPhone in 2011, what does that tell us about manufacturing productivity? 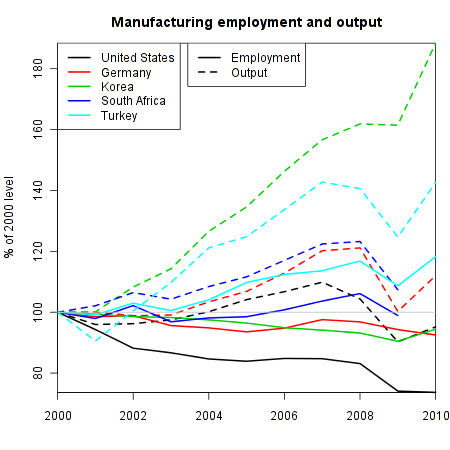 There are multiple sources of data on manufacturing output available. My last post used the Federal Reserve’s Industrial Production data. The Fed says that this series “measures the real output of the manufacturing, mining, and electric and gas utilities industries”. They further explain that this measure is based on “two main types of source data: (1) output measured in physical units and (2) data on inputs to the production process, from which output is inferred.”. Another U.S. government source is the Bureau of Economic Analysis data on value added by industry, which “is equal to an industry’s gross output (sales or receipts and other operating income, commodity taxes, and inventory change) minus its intermediate inputs (consumption of goods and services purchased from other industries or imported).” For international comparisons, the OECD provides a set of numbers based on what they call “indices of industrial production”–which, for the United States, are the same as the Federal Reserve output numbers. And the United Nations presents data for value-added by industry, which covers more countries than the OECD and is supposed to be cross-nationally comparable, but does not quite match up with the BEA numbers. The first question to ask is: how comparable are all these different measures? Only the Fed/OECD numbers refer to actual physical output; the BEA/UN data appears to be based only on the money value of final output. Here is a comparison of the different measures, for the years in which they are all available (1970-2009). The numbers have all been put on the same scale: percent of the value in the year 2007. 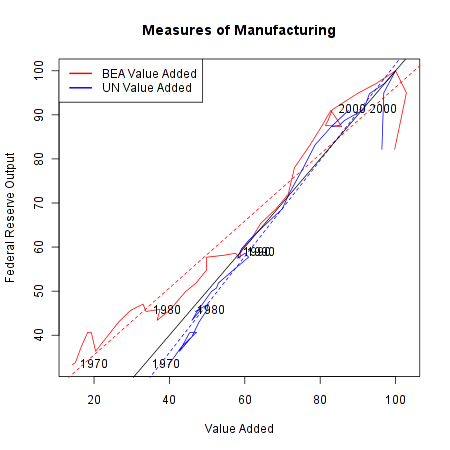 The red line shows the relationship between the BEA value added numbers and the Fed output numbers, while the blue line shows the comparison between the UN value-added data and the Fed output data. The diagonal black line shows where the lines would fall if these two measures were perfectly comparable. While the overall correlation is fairly strong, there are clear discrepancies. In the pre-1990 data, the BEA data shows manufacturing output being much lower than the Fed’s data, while the UN series shows somewhat higher levels of output. The other puzzling result is in the very recent data: according to value-added, manufacturing output has remained steady in the last few years, but according to the Fed output measure it has declined dramatically. It’s hard to know what to make of this, but it does suggest that the Great Recession has created some issues for the models used to create these data series. What I would generally say about these findings is that these different data sources are sufficiently comparable to be used interchangeably in making the points I want to make about long-term trends in manufacturing, but they are nevertheless different enough that one shouldn’t ascribe unwarranted precision to them. However, the fact that all the data are similar doesn’t address the larger question: how can we trust any of these numbers? Specifically, how do government statistical agencies deal with the problem of comparing qualitatively different outputs over time? Contemporary National Accounts data tracks changes in GDP using something called a “chained Fisher price index”. Statistics Canada has a good explanation of the method. There are two different problems that this method attempts to solve. The first is the problem of combining all the different outputs of an economy at a single point in time, and the second is to track changes from one time period to another. In both instances, it is necessary to distinguish between the quantity of goods produced, and the prices of those goods. Over time, the nominal GDP–that is, the total money value of everything the economy produces–will grow for two reasons. There is a “price effect” due to inflation, where the same goods just cost more, and a “volume effect” due to what StatCan summarizes as “the change in quantities, quality and composition of the aggregate” of goods produced. creating such a summation is problematic in that it is not possible to add quantities with physically different units, such as cars and telephones, even two different models of cars. This means that the quantities have to be re evaluated using a common unit. In a currency-based economy, the simplest solution is to express quantities in monetary terms: once evaluated, that is, multiplied by their prices, quantities can be easily aggregated. So after correcting for the price increase, the actual increase in the amount of shoes produced is 25 percent. Although the example is a tremendous simplification, it is in essence how growth in output is measured by national statistical agencies. In order for this method to work, you obviously need good data on changes in price. Governments traditionally get this information with what’s called a “matched model” method. Basically, they try to match up two identical goods at two different points in time, and see how their prices change. In principle, this makes sense. In practice, however, there is an obvious problem: what if you can’t find a perfect match from one time period to another? After all, old products are constantly disappearing and being replaced by new ones–think of the transition from videotapes to DVDs to Blu-Ray discs, for example. This has always been a concern, but the problem has gotten more attention recently because of the increasing economic importance of computers and information technology, which are subject to rapid qualitative change. For example, it’s not really possible to come up with a perfect match between what a desktop computer cost ten years ago and what it costs today, because the quality of computers has improved so much. A $1000 desktop from a decade ago would be blown away by the computing power I currently have in my phone. It’s not possible to buy a desktop in 2011 that’s as weak as the 2000 model, any more than it was possible to buy a 2011-equivalent PC ten years ago. Experts in national accounts have spent a long time thinking about this problem. The OECD has a very useful handbook by price-index specialist Jack Triplett, which discusses the issues in detail. He discusses both the traditional matched-model methods and the newer “hedonic pricing” methods for dealing with the situation where an old product is replaced by a qualitatively different new one. Traditional methods of quality adjustment are based on either measuring or estimating the price of the new product and the old one at a single point in time, and using this as the “quality adjustment”. So, for example, if a new computer comes out that costs $1000, and it temporarily exists in the market alongside another model that costs $800, then the new computer is assumed to be 20 percent “better” than the old one, and this adjustment is incorporated into the price adjustment. The intuition here is that the higher price of the new model is not due to inflation, as would be assumed in the basic matched-model framework, but reflects an increase in quality and therefore an increase in real output. Meaning that real output has increased by 56 percent, or more than the nominal amount of revenue growth, even adjusting for inflation. In practice, it’s often impossible to measure the prices of old and new models at the same time. There are a number of methods for dealing with this, all of which amount to some kind of imputation of what the relative prices of the two models would have been, had they been observed at the same time. In addition, there are a number of other complexities that can enter into quality adjustments, having to do with changes in package size, options being made standard, etc. For the most part, the details of these aren’t important. One special kind of adjustment that is worth noting is the “production cost” adjustment, which is quite old and has been used to measure, for example, model changes in cars. In this method, you survey manufacturers and ask them: what would it have cost you to build your new, higher-quality model in an early period? So for a computer, you would ask: how much would it have cost you to produce a computer as powerful as this year’s model, if you had done it last year? However, Triplett notes that in reality, this method tends not to be practical for fast-changing technologies like computers. Although they are intuitively appealing, it turns out that the traditional methods of quality adjustment have many potential biases. Some of them are related to the difficulty of estimating the “overlapping” price of two different models that never actually overlapped in the market. But even when such overlapping prices are available, there are potential problems: older models may disappear because they did not provide good quality for the price (meaning that the overlapping model strategy overestimates the value of the older model), or the older model may have been temporarily put on sale when the new model was introduced, among other issues. The problems with traditional quality adjustments gave rise to an alternative method of “hedonic” price indexes. Where the traditional method simply compares a product with an older version of the same product, hedonic indices use a model called a “hedonic function” to predict a product’s price based on its characteristics. Triplett gives the example of a study of mainframe computers from the late 1980’s, in which a computer’s price was modeled as a function of its processor speed, RAM, and other technical characteristics. The obvious advantage of the hedonic model is that it allows you to say precisely what it is about a new product that makes it superior to an old one. The hedonic model can either be used as a supplement to traditional method, as a way of dealing with changes in products, or it can entirely replace the old methods based on doing one-to-one price comparisons from one time period two another. The important thing to understand about all of these quality-adjustment methodologies is what they imply about output numbers: growth in the output of the economy can be due to making more widgets, or to making the same number of widgets but making them better. In practice, of course, both types of growth are occuring at the same time. As this discussion shows, quality adjustments are both unavoidable and highly controversial, and they introduce an unavoidable subjective element into the definition of economic output. This has to be kept in mind when using any time series of output over time, since these numbers will reflect the methdological choices of the agencies that collected the data. 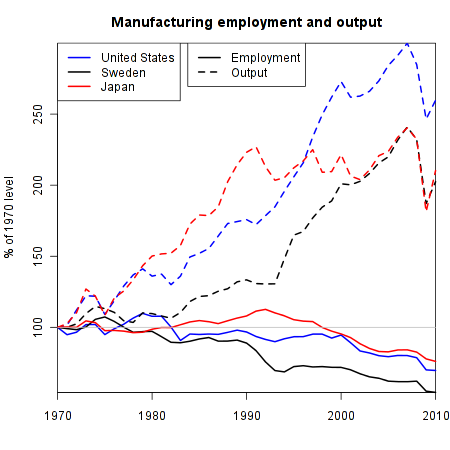 Despite these caveats, however, wading into this swamp of technical debates has convinced me that the existing output and value-added numbers are at least a decent approximation of the actual productivity of the economy, and are therefore suitable for making my larger point about manufacturing: the decline of manufacturing employment is less a consequence of globalization than it is a result of technological improvements and increasing labor productivity. The other day I got involved in an exchange with some political comrades about the state of manufacturing in the United States. We were discussing this Wall Street Journal editorial, which laments that “more Americans work for the government than work in construction, farming, fishing, forestry, manufacturing, mining and utilities combined”. Leaving aside the typical right-wing denigration of government work, what should we think about the declining share of of Americans working in industries that “make things”? I’ve written about this before. But I’m revisiting the argument in order to post an updated graph and also to present an alternative way of visualizing the data. Every time I hear a leftist or a liberal declare that we need to create manufacturing jobs or start “making things” again in America, I want to take them by the collar and yell at them. Although there is a widespread belief that most American manufacturing has been off-shored to China and other low-wage producers, this is simply not the case. As I noted in my earlier post, we still make lots of things in this country–more than ever, in fact. We just do it with fewer people. The problem we have is not that we don’t employ enough people in manufacturing. The problem is that the immense productivity gains in manufacturing haven’t accrued to ordinary people–whose wages have stagnated–but have instead gone to the elite in the form of inflated profits and stock values. 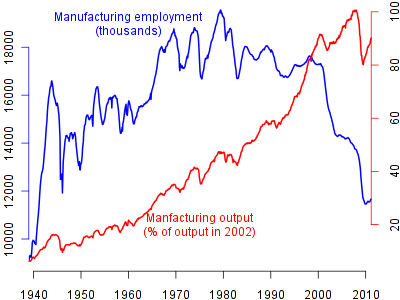 This graph is interesting because it seems to show three pretty different eras in manufacturing. 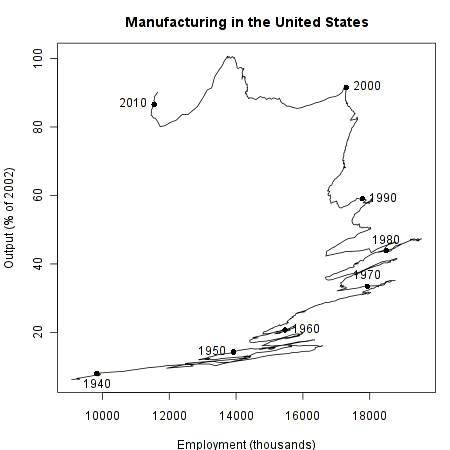 From the 1940’s until around 1970, there was a growth in both employment and output. This, of course, corresponds to the “golden age” of post-war Keynesianism, where the labor movement submitted to capitalist work discipline in return for receiving a share of productivity gains in the form of higher wages. From 1970 until around 2000, output continues to rise rapidly, but employment stays basically the same. Then in the last ten years, employment falls dramatically while output remains about the same. This big take-home point from all this is that manufacturing is not “in decline”, at least in terms of output. Going back to an economy with tons of manufacturing jobs doesn’t make any more sense than going back to an economy dominated by agricultural labor–due to increasing productivity, we simply don’t need that many jobs in these sectors. Which means that if we are going to somehow find jobs for 20 million unemployed and underemployed Americans, we’re not going to do it by building up the manufacturing sector.